In 1983, the landscape of professional wrestling was much different than it is today, but it would be thrown into upheaval. Dozens of territories dotted the United States and Canada with three major promotions dominating the industry: 1) the National Wrestling Alliance (comprised of various independent promotions); 2) the American Wrestling Association; and 3) the World Wrestling Federation. By the end of the decade, most of these promotions would be gone, largely due to the work of one man-Vincent Kennedy McMahon. In 1948, a group of promoters met to form what critics (as well as the federal government) called a monopoly, the organization known as the National Wrestling Alliance (NWA). Wrestling promotions existed for decades, but promoters hoped the NWA would establish order in the business, detailing who would work in which areas and setting up one world champion. Although Verne Gagne formed the AWA and Vince Jesse McMahon formed the World Wide Wrestling Federation, these promotions and the NWA learned to get along more or less. By the early 1980’s, technology was changing the way wrestling was promoted. Cable television allowed promoters to reach an audience outside of their designated territory. For example, Georgia Championship Wrestling aired on WTBS while Southwest Championship Wrestling aired on USA Network. Thanks to the cable coverage, each promotion aired shows outside of their market, which meant the potential to promote in other areas. The only thing keeping them from venturing into other territories was the longstanding agreement not to. Promoter Vince McMahon had the ambition (some would say the audacity) to expand his promotion beyond its traditional northeastern boundaries. McMahon wanted to attract the best of the best so he hired wrestlers from rival promotions, both taking their top stars, and depriving them of these stars. 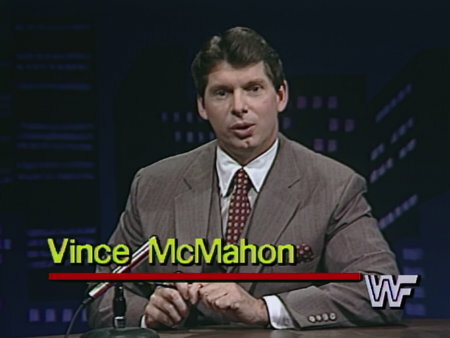 McMahon also bought out TV time from rival promotions, denying them of a way to promote shows. McMahon’s aggressive (some would argue predatory) business practices took many promoters by surprise. In his defense, the NWA had run a monopoly through much of America for decades, banding together to stop competition when a would-be rival tried to operate in their territory. Several promoters tried banding together to compete with McMahon. One venture was Pro Wrestling USA, a collaboration of various promoters which ran shows and aired a weekly television show. However, the promoters couldn’t cooperate for long and soon they were on their own. By 1990, most of the NWA territories were dead. Jim Crockett Promotions was the largest member of the NWA but its attempt to go national failed, due to bad booking and bad business practices. The AWA was all but dead (and would close in 1991). Crockett would be bought by Ted Turner and renamed World Championship Wrestling, eventually competing with the WWF and nearly putting it out of business. Anderson, Ole and Scott Teal. Inside Out: How Corporate America Destroyed Professional Wrestling. Crowbar Press, 2003. Dillon, James J. Wrestlers Are Like Seagulls: From McMahon to McMahon. Crowbar Press, 2005. Hornbaker, Tim. Capitol Revolution: The Rise of the McMahon Wrestling Empire. ECW Press, 2015. Molinaro, John. “End of an era on TBS Solie, Georgia and ‘Black Saturday.’” Slam! Sports. Slam! Wrestling. 3 Apr. 2001. http://slam.canoe.com/SlamWrestlingFeatures/tbs1-can.html. Accessed 29 May 2017. Shields, Brian. Main Event: WWE in the Raging 80’s. World Wrestling Entertainment, 2006. Solomon, Brian. WWE Legends. World Wrestling Entertainment, 2006. The Spectacular Legacy of the AWA. Directed by Kevin Dunn, performances by Adrian Adonis, Adnan Al-Kaissy, and Ole Anderson, World Wrestling Entertainment, 2006. The True Story of WrestleMania. Directed by Kevin Dunn, performances by Lou Albano, Ken Anderson, and Andre the Giant, WWE Studios, 2011. Watts, Bill and Scott Williams. The Cowboy and the Cross: The Bill Watts Story: Rebellion, Wrestling and Redemption. ECW Press, 2006. WWE: The Rise and Fall of WCW. Directed by Kevin Dunn, performances by Terry Allen, Dusty Rhodes, and Arn Anderson, World Wrestling Entertainment, 2009.